As the seasons' change and the days become a little lighter, a little greener, and a little more cheerful, springtime arrives in the miniature garden in full force. For Peter Rabbit and friends from Beatrix Potter’s classic stories, nothing quite says “springtime” like a trip to Cotswold Cottage! Easter season in the Old English countryside means rolling hills, sweet-smelling flowers, and a freshly thatched roof on top of the cottage. 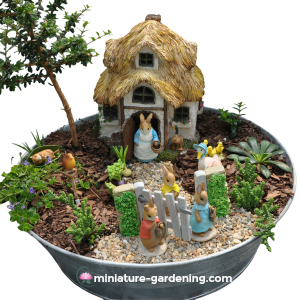 Today Peter Rabbit and his best buddies are out adventuring in the miniature garden. When he isn’t busy swiping vegetables like carrots, onions, turnips, and more from mean Mr. McGregor, he is hopping about, racing his wheelbarrow, and hiding inside watering cans. Always up to his old tricks! Peter has been trying to visit Mrs. Tiggy Winkle in her country miniature house. He loves to stop by and share a cup of tea with her. Whom else can you spot in Mrs. Tiggy Winkle’s garden? Why, there are Flopsy, Mopsy, and Cottontail, everyone’s favorite trio of mischievous bunnies, each done up in their Sunday best. I wonder what is inside their basket—could it be cookies or carrots to share? You will have to use your imagination to decide. If you look closely in the garden, you might also spot Jemima Puddle Duck and her three baby chicks, waddling along, headed to Easter breakfast. You can always pick out Jemima, with her fancy blue hat and ruffled pink cape. Her young ducklings know to follow closely, or they might be left behind! Between the moss, pebbles, and miniature plants in the garden, Timmy Willie hides. Timmy is so tiny that he often gets overlooked, but this minuscule mouse is full of personality! He seems to be counting peas in a pod, one of his favorite activities. Perhaps Peter can convince him to come along on the visit to everyone’s favorite hedgehog, Mrs. Tiggy Winkle. There is sure to be a cup of tea small enough for Timmy Willie if he finds the bravery to ask. Benjamin Bunny is here too and looking quite dashing this morning, outfitted in a coat, sweater, and impressive hat. His inquisitive ears peek out of the top of the hat—what could he be hearing? Benjamin always knows what is happening in the miniature garden, for he is one of the best listeners there is. Please do not ask him to speak though. He is also one of the shyest bunnies around. If there is one person who can get all the garden friends to play nicely together, it is Mrs. Rabbit. It seems she has been visiting Mrs. Tiggy Winkle today as well, bringing well wishes to her favorite friend and neighbor. Could there be other garden friends near the miniature trees or additional fairy garden accessories on the opposite side of the garden gate? You will have to explore and find out! Mrs. Rabbit, Peter Rabbit, and all of the garden companions are award-winning favorites that have been specially designed for little children’s small hands. Safe, durable, and realistic, children love to imagine garden adventures again and again with these extra-special figures. Consider brightening up your spring garden or putting a twist on the traditional Easter or May Day basket with the addition of some new miniature gardening friends! Peter and his friends show us time and time again that there are all sorts of adventures to be had in the miniature garden, and so many wonderful memories to be made. This blog post was published on 03/21/2019 15:00:00.